In our last post, we have mentioned once about Compass. According to the official site, it is described as an open-source CSS Authoring Framework. In short, Compass is a Sass extension and, like LESS Element of LESS, it has a bunch of ready-to-use CSS3 Mixins, except it has also added several other stuff that make it a more powerful companion tool to Sass. Let’s check it out. 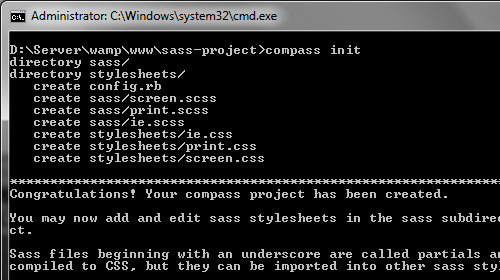 Compass, like Sass, needs to be installed in our system. But, if you are using an application like Scout App or Compass.app, this will not be necessary. Then, run the following command line in your working directory to add Compass project files. If you have run this command compass init, you should now have a file named config.rb in your working directory. This file is used to configure the project output. For example, we can change our preferred directory names. Strip out the comment line that is generated by Compass; we set true if we need the comments to be printed or false if it doesn’t have to. We can also decide the CSS output. There are four options we can select :expanded, :compact, :compressedand :nested. For now, we just need it to be expanded as we are still in the development stage. I think these configurations will suffice for most projects in general, but you can always refer to this documentation, Compass Configuration Reference if you need more preferences. This command line, as in Sass, will watch every file change, and create or update the corresponding CSS files. But remember, run this line after you have done configuring the project in config.rb, or else it will just ignore the changes in the file. Before walking through CSS3, in our primary .scss file, we need to import the Compass with the following line @import "compass";, this will import all the extensions in Compass. But, if we need only CSS3 we can also do it more specifically with this line @import "compass/css3". This border-radius Mixins will generate all the browser prefixes and, by default, the corner radius will be 5px. But, we can also specify the radius to our need this way @include border-radius(10px); }. This Mixins will also generate those tedious vendor prefixes and the rotation will take 45 degree by default. See the generated CSS below. One of the most powerful features in Compass is the Helpers. 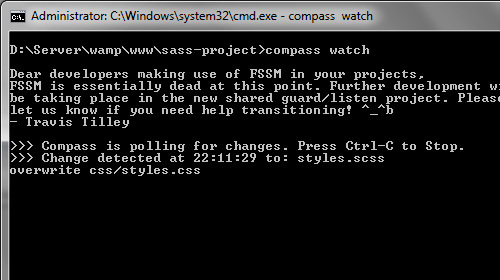 According to the official site, The compass helpers are functions that augment the functions provided by Sass. Alright, let’s take a look at the following examples to get a clear picture. In this example, we are going to add custom font family with @font-face rule. In plain CSS3, the code may look something like this below, consisting of four different font types and it is also hard to remember for some people. The code above will generate a result that is exactly the same as the first code snippet, it will also automatically detect the font type and add it to the format() syntax. So, let’s say we change it to fonts_dir = "myfonts", then the generated code will be url('/myfonts/font.ttf'). By default, when we are not specifying the path, Compass will direct it to stylesheets/fonts. In Compass, rather than using the url() function, we can replace it with image-url() Helpers and similar to adding @font-face above, we can completely ignore the path and let Compass handle the rest. This code will also generate the exact same CSS declaration as in the first snippet. Alright, we have discussed quite a lot about Compass today and as you can see it’s really a powerful tool and let us write CSS in a more elegant way. And, as you already knew, Sass is not the only CSS Preprocessor; there is also LESS which we have thoroughly discussed before. In the next post, we will try to compare, head-to-head, which one of these two does the job better in preprocessing CSS.